"When we were in the library (if you want to call it that because there weren’t any books except old law books) I saw a flyer on the office door advertising a books and bras drive. I asked the person working there, she said it was from Penn State/ Main Campus. She said they collected 40 bras and 20 boxes of books a few years back. She told me that the prison doesn’t provide bras so the prisoners have to request them and then they are only available if they have been donated." DelcoCPR leader Kabeera Weissman reached out to George W. Hill Superintendent John Reilly who agreed to the drive. DelcoCPR members Michelle Midgette and Nicole Johns, alongside Gwen, generously offered to act as drop-off locations for the donations that poured in. 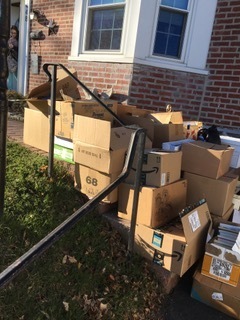 Community members donated over 150 bras and 80 boxes of books directly and through an Amazon wishlist! It took four cars to deliver the bras and books to George W. Hill Correctional Facility, where they were put to use immediately for our incarcerated sisters and brothers. Thank you to everyone who donated from your homes and your hearts! Thank you for your interest in DelcoCPR!